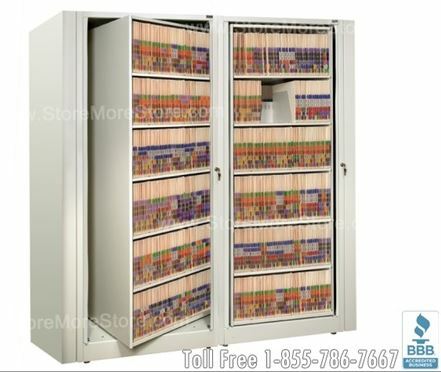 The first Rotary File Cabinet you purchase needs to be a “starter cabinet” because it can stand completely on its own. After you purchase a “starter cabinet”, you can connect “adder cabinets” to create a row of Rotary File Cabinets. The row can function as a dividing wall between offices or be placed against a wall to have the double sided storage system save floor space. In addition, you can purchase all “starter cabinets” and have a completely modular and flexible Rotary File Cabinet storage system that can be reconfigured or moved at any time. Rotary File Cabinets are available in 19 different colors to match any office décor. Also, the Rotary File Cabinets you buy from us will come fully assembled and be delivered to your loading dock completely ready to be put in place. You just need to add all of your files, boxes, binders, book, computer media, and supplies and you are ready to go. Shop Online Now at StoreMoreStore for Rotary File Cabinets! 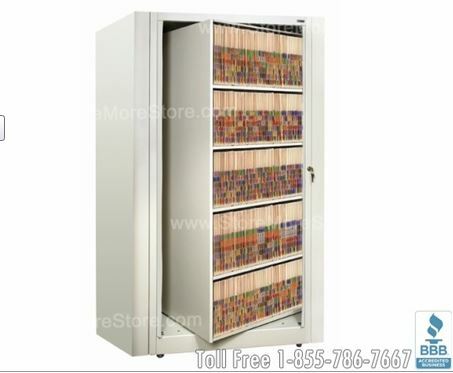 At StoreMoreStore, we have numerous sizes and styles of Rotary File Cabinets for you to purchase online! However, if you’re not sure what the best Rotary File Cabinet option is for your office, just give us a call toll free at 1-855-786-7667 and we will help you design a Rotary File Cabinet that will meet all of your requirements.